By Norman Chan on April 15, 2014 at 5:53 p.m.
Project Ara is real, and Google has its fingers on the pulse of the technologies required to make modular smartphones a reality. After attending the first Project Ara developers conference, here's what I consider the important takeaways from what Google has revealed so far. Project Ara is real, and Google has its fingers on the pulse of the technologies required to make modular smartphones a reality. Given the overwhelming public response to the Phonebloks concept, it's something that users seem to want, too. But whether or not Project Ara modular phones have a future in the smartphone marketplace will largely depend on whether or not there's a strong hardware ecosystem to support it. The custom PC market wouldn't have flourished a decade ago if component manufacturers weren't making user-friendly video cards, storage drives, motherboards, and power supplies--the building blocks of a PC. That's the point of this week's Ara Developers Conference: getting partners excited and educated about how they can build hardware to support that vision for a modular phone. The two-day conference, which was also streamed online, coincided with the release of the Project Ara MDK, or Module Developers Kit. This MDK provides the guidelines for designing Ara-compatible hardware, and along with the technical talks presented at the conference, offer the first clear look in the technologies that make Ara possible, if not completely practical. I attended the conference and read through the MDK to get a high-level understanding Google's plans for Ara, which goes far to address the concerns we and experts have had about the modular phone concept. I'm not yet a believer, but at least this clearly isn't a pipe dream. The following are what I consider the important takeaways from what Google has revealed so far. 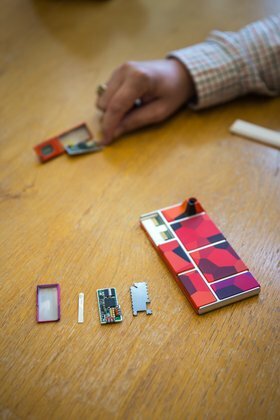 A brief note: the conference was also the first public showing of a Project Ara working prototype (past photos have been of non-functioning mockups), though the unit was unable to boot up and had a cracked screen. A little appropriate, given that both the main processing unit and screen are replaceable modules. 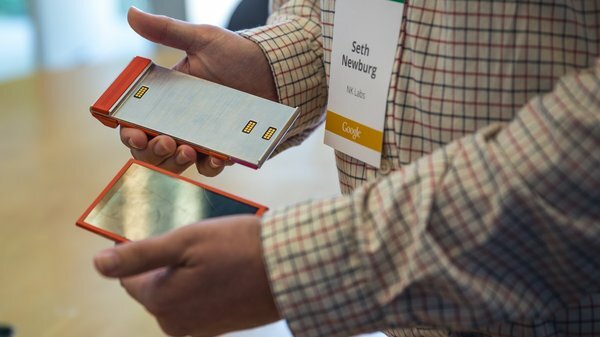 On the hardware side, Google has laid out specific guidelines for how Project Ara phones can be built. The most important piece of hardware is the chassis, or what Project Ara leads are calling the "Endoskeleton." Think of this as an analogue to a PC case--it's where all the modular components will attach. In fact, it reminds me a lot of the design of Razer's Project Christine, in that a central "spine" traverses the length of Project Ara phones, with "ribs" branching out to split the phone into rectangular subsections. In terms of spatial units, the Endoskeleton (or Endo) is measured in terms of blocks, with a standard phone being a 3x6 grid of blocks. A mini Ara phone spec would be a 2x5 grid, while a potential large phone size would be a 4x7 grid. Fitting into the spaces allotted by the Endos structure would be the Project Ara Modules, the building blocks that give the smartphone its functionality. These modules, which can be 1x1, 2x1, or 2x2 blocks, are what Google hopes its hardware partners will develop to sell to Project Ara users. Modules can include not only basic smartphone components like the display, speakers, microphone, and battery, but also accessories like IR cameras, biometric readers, and other interface hardware. The brains of a Project Ara phone--the CPU and memory--live in a primary Application Processor module, which takes up a 2x2 module. (In the prototype, the AP was running a TI OMAP 4460 SoC.) While additional storage can be attached in separate modules, you won't be able to split up the the AP--processor, memory, SD card slot, and other core operational hardware go hand-in-hand. Project Ara's prototype Application Processor module, which house the CPU, memory, SD card slot, and other core hardware. 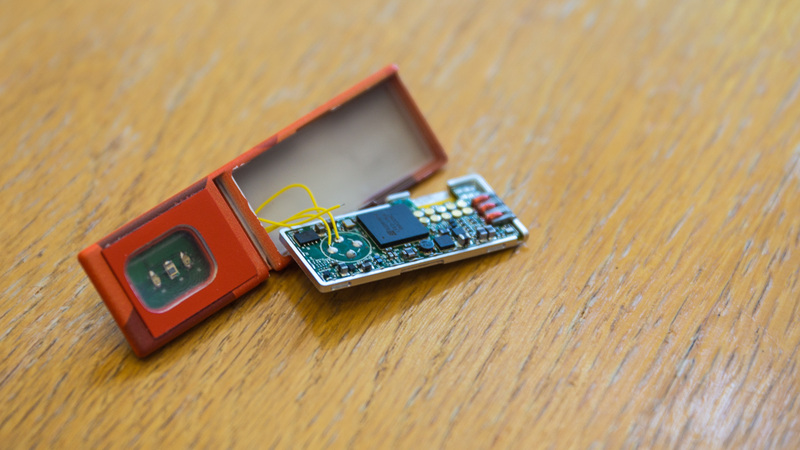 The first is UniPro, which is a high-speed interface protocol that Project Ara uses to allow its modules to speak to each other, though the hardware of the Endo. 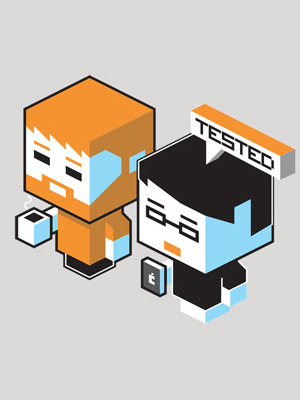 They share a common low-level language for communicating and building a network. The UniPro protocol has been in development for several years as a way to build a standard for mobile phone accessories--think of it like the USB protocol, but optimized for mobile. 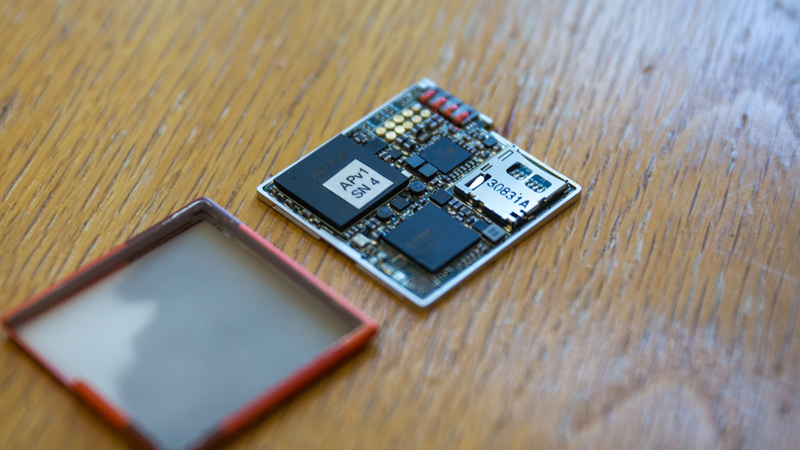 Its development is overseen by the MIPI Alliance, an organization composed of over 250 mobile companies, and Project Ara is tapping into the latest UniPro 1.6 spec, which offer high-bandwidth and low power connections between the modules. Even though the modules know how to speak to each other, they need a way to physically connect to the Endo. The second technology Project Ara uses is capacitive M-PHY, a physical layer spec also developed by the MIPI Alliance and made to work with UniPro. For Project Ara, M-PHY is a capacitive interface, which means that the connection points won't be worn down over time from swapping modules in and out of the phone. Ara's implementation of the M-PHY interface block calls for 10 connection points, eight of which are for data (four pairs of lanes), one for power, and one for ground. The final technology in Project Ara's module design is the use of electropermanent magnets for affixing the modules in place in the Endo. This is really cool--normal electromagnets magnetize depending on if current is running through them. That would be a battery drain, but electropermanent magnets only use current to flip magnetization on and off; it's able to retain its magnetized state without draining additional power. 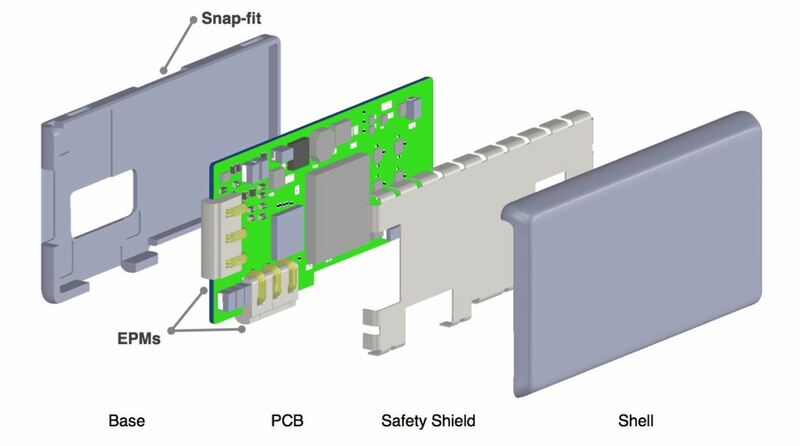 Project Ara engineers are hoping that electropermanent magnet design can be further miniaturized before modules go into production, since every bit of PCB space in the module is precious. When users buy a Project Ara phone, they'll start by buying just the Endoskeleton and basic components, which Google has priced at around $50 for what they call a basic "grey" phone. That includes $15 for the Endo frame, $15 for the display, $5 for a battery, $10 for the main Application Processor module, and $5 for a Wi-Fi unit. These are just the bill of materials cost, and aren't what users will actually pay for modules, but Google is confident that getting started with a working Project Ara phone will cost well under $100. In terms of overall pricing for building a full-featured Project Ara phone, Google says that the only real cost overhead for Ara modules are Unipro technology and the electropermanent magnets. In addition, they expect that a flourishing component ecosystem will drive down prices and offer users more options for pricing. Once you buy an Endo, Google expects that it should last you 5-6 years. The capacitive pads for the modules go a long way to keeping the metal Endos durable, and the UniPro/M-PHY interface has enough bandwidth for futureproofing (10Gb/s for most modules, 20Gb/s for large modules). The Endo will have a small battery built-in to supply reserve power, and that's one of the limiting factors for the lifespan of a Project Ara shell. That built-in battery in the Endo is separate from the battery that will normally power the phone, and is needed to support hot swapping. Users will be able to swap out almost every module type without having to power down or reset their phone, the display and AP notwithstanding (for obvious reasons). That means that you'll be able to replace the main battery when it's low without turning off your phone, something that no smartphone can do today, even with external power attached. Google showed several prototype modules, including a Wi-Fi unit, biometric sensor (which measured pulse using an IR camera), and a dummy module that does nothing. The dummy module showed that developers will have about 40% of the PCB add their own hardware, with the rest dedicated to Ara-specific chips and tech, such as the magnets and UniPro processing. For larger modules, developers are able and encouraged to maximize their use of space, meaning that modules can have multiple functions. In fact, to build the display module, the Project Ara team used a Samsung screen that didn't take up all of the space available, so they packed in another small battery. Batteries everywhere, please. 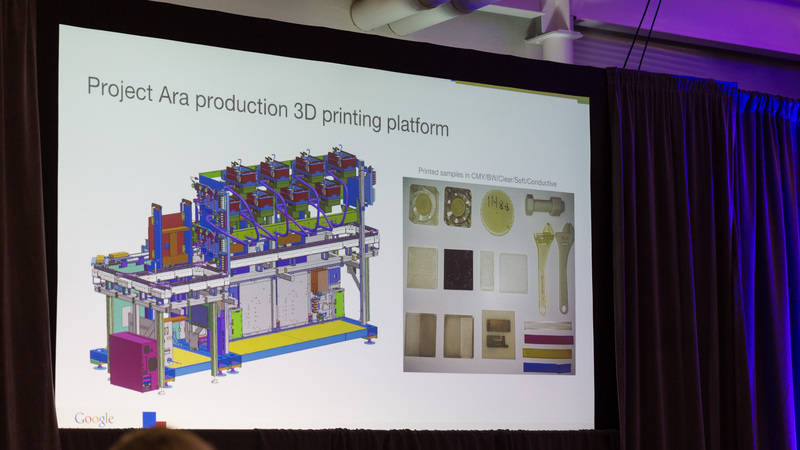 Even if Project Ara doesn't work out, there's one industry that may benefit from the R&D conducted for it: 3D printing. Google is working with 3D Systems in developing a new 3D printing machine that can print efficiently at volume, something that existing printers are not very good at. 3D printing will be used for Ara phone users to customize the casings for their modules, which are user-serviceable and snap fit around the PCB and safety shield. The 3D printer in developing will print acrylic-based plastic, similar to what Shapeways calls its Detailed Plastic material. It'll be able to print cases in CMYK color (plus clear) with detail at 600DPI, and a sub-micron surface finish. The new printer, which is expected to be completed for Alpha testing mid-summer, prints using an assembly line track that goes in oval, like a racetrack. Unlike 3D printers like the MakerBot, the print head or build platform doesn't move back and forth across two axes--multiple heads and platforms work in unison, moving in just one direction to increase print efficiency. Google is also working with Carnegie Mellon to develop conductive ink printing, so 3D printers can print electronics, like a Wi-Fi antenna while making a module casing. 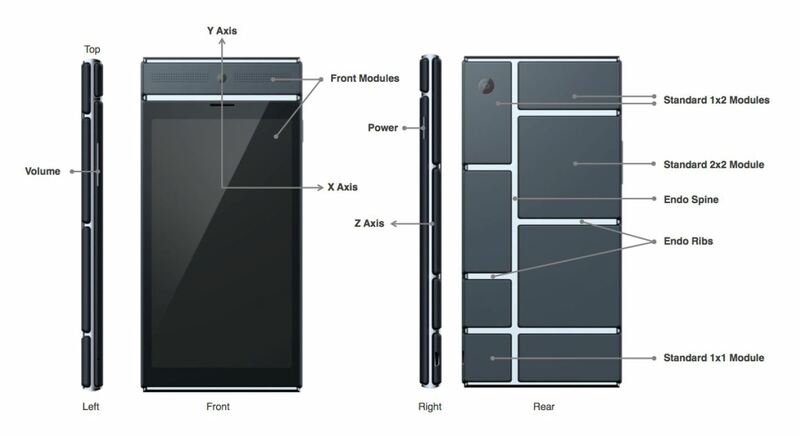 This technology is still a ways off, and won't make the 2015 Project Ara launch. There will also be a second Project Ara developers conference the July for artists and 3D printing companies to get involved. Because of the driver code required to support UniPro modules and other accessories, Project Ara phones will run a fork of Android for the foreseeable future, less the core Android team deems those features worthy to include in the mainline release. The software stack for Project Ara is one of the development threads that needs to be resolved before these phones can work, since Android doesn't support dynamic hardware configurations today. Ara will introduce generic class driers for UniPro modules (similar to how USB is processed), and some hardware drivers will be to be downloaded through a software distribution system like Google Play. Project Ara's leads made it very clear that they were not trying to build a jack-of-all-trades platform that would serve to be the hardware for the Internet of Things. That is, don't expect to plug Project Ara modules into watches or refrigerators. They want to build a viable smartphone platform first. 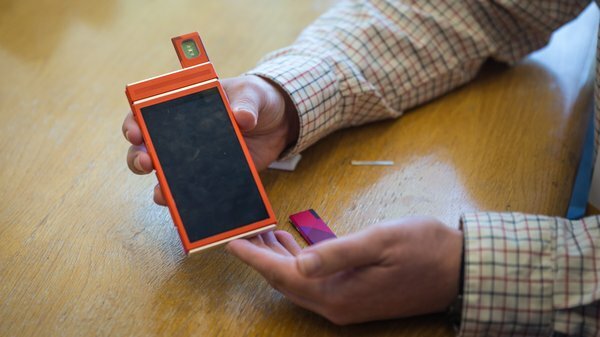 But that doesn't mean that Project Ara devices have to be used as phones. You could imagine giving a child an Ara Endo with basic media and camera functionality but no Wi-Fi or cellular modules, allowing them access only when they're ready. It's like buying someone an iPod Touch that could later be upgraded to an iPhone. As part of Google's ATAP (Advanced Technologies and Products) division, Project Ara is only given 24 months to go from concept to real product that users can buy--or at least one that demonstrates market viability. That urgency, along with the fact that only three Googlers are working Ara full-time, allows the team to take more risks and recruit technologists without having to commit them to a long-term tenure. It's a model that Google is adapting from DARPA, where Project Ara lead Paul Eremenko worked before Motorola and Google. Eremenko will take Project Ara through fruition in April 2015, which means Project Ara phones are much closer to reality than concept. Two more developer conferences are planned before the year is out, and pre-production prototypes are scheduled for December. That basic "Grey" Endo may be available for early-adopters to tinker with as early as January 2015. 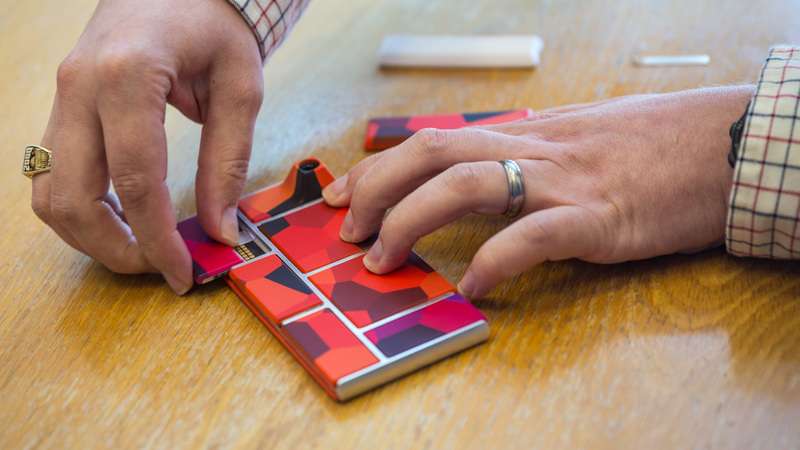 Got any questions about Project Ara you didn't see answered here? Post your thoughts in the comments below and I'll do my best to address them based on what I know so far.